As the smartphones become more pervasive in the market, the world’s famous mobile phone powerhouse, Nokia has launched a new inexpensive touchscreen smartphone to its popular C5 series which is named as C5-03. The new touchscreen device has been equipped with a couple of neat features to meet the need for daily use. As compared to its preceeding model, the connectivity of the C5-03 has been upgraded with Wi-Fi for improved Internet access. Unfortunately, the new C5-03 is runs on Symbian^1 (aka S60 5th edition touch-edition) rather than the latest Symbian^3 platform. Featured with a 3.2-inch touch screen display, the Nokia C5-03 is also equipped with a 5-megapixel camera with 4x digital zoom without flash. It boasts with a compass and assisted GPS for use with the free Ovi Maps hands-free nagivation service, built-in up to 40MB of user memory, integrated with Nokia messaging for webmail or POP3 service and the ability to access Ovi Music or Ovi Store. Furthermore, it supports up to 16GB of microSD memory card and comes with a battery that provides up to 11.5 hours of talktime for GSM or 4.5 hours for 3G and up to 25 days of standby time. 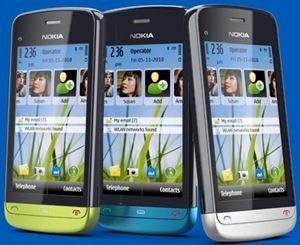 Available in two-tone colour in both bold and restrained flavours, the Nokia C5-03 with dimensions of 105.8 mm x 51.0 mm x 13.8 mm and weighs 93g is expected to be available globally at end of this quarter for the price of €170 before taxes or operator subsidies.